Location: Lower Mainland BC what is the corresponding Costco number? Based on this info (click on the link), the only Group 24 is a deep cycle/marine and they only stock those come spring. Location: Lower Mainland BC In the absence of any answers/comments, I went out today to Walmart to check out what they might have in the way of Group 24 or 27. Found a 27 but the only 24 was a 24F as in "F" = Ford which has the terminals at the opposite side/end than what a Group 24N (N = normal has). What I did "discover" was a Group 34 battery. Length and width are the same as a 24 but the height is a bit shorter. Lots of Cold Cranking Amps and an okay(ish) price. I had no clue what a Group 34 was used in but eventually I found that it was used in "Chryslers" so I went back to the Costco Battery finder and found a Group 34 there as well. Kirkland Item 315549 for a 2002 Chrysler 300 with a 3.5L V6. Costco price is 119.99 (plus core) compared to Walmart at $136.97. I think I will go with Costco because their warranty and return policy seems to be a bit better than Walmart's. Location: Netherlands I never dug into those 'group' namings when it comes to batteries. When shopping for one I just took measurements of the battery-tray and got one that fit nicely in there. 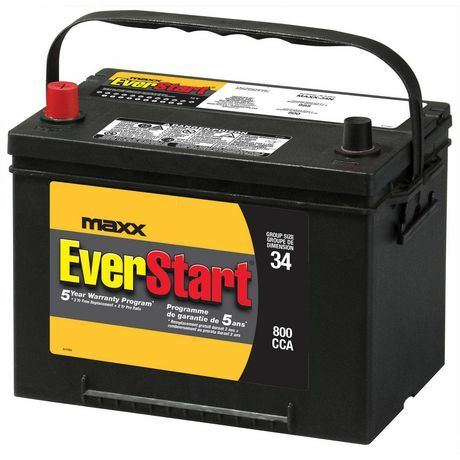 Then again, I'll also never buy 'regular' lead/acid batteries since I've turned to gel-batteries. Even when bought used they have served me well for many years. Location: Southern Sweden - Sturkö island I find it strange that the amp isn't in the specifications. I bought a Tudor 90 amps and that cranks away really good. I have a 4 year warranty battery in my '89 Lemans right now that will 5 years old and still working this coming March. Check the date codes on the battery and get the newest one you can. Charge it completely before putting it in. Doesn't really matter where a battery comes from because they come likely from the same plants just carrying different lables. I have a NAPA gold line in my '56 Imp because of the cold crank and reserve. I think it is a group 27 series 75, big powerfull battery. Went to Costco today. Went to the Tire counter and waited in line for 5 minutes to be served only to be told that the batteries were self serve in Aisle 14 (or some such). I looked through the Costco battery selection book. They don't have any Group 24 or Group 27 batteries so I went with Group 34 which is Costco "Fitment 4" sealed battery. Same length and width as a Group 24 but a bit less tall. CDN $119.99 plus $10 refundable core charge (plus taxes). Came home and installed it. Checked the voltage and it was only 12.5 volts but the car started right up (I had previously started it on the much hated $80 Group 24 battery that I bought 2 years ago and now have found that it won't hold a charge). The new battery seems to have settled down the voltage regulator (which now seems more steady while on the + side (charging)). Time will tell. The Kirkland has a 3 year replacement warranty and then it is prorated, e.g. 37 months = 60% and 100 months = 95% (or some such). Better than most of the alternatives.